Natural disasters affect roughly 217 million people each year, and emerging markets are particularly vulnerable. When disasters strike, communities are devastated. Families are left scrambling while businesses stave off financial ruin. To reduce vulnerability and increase a community’s ability to bounce back, governments must devise a plan to address the needs of their communities while allaying the panic that ensues. To get ahead of these problems, the Sendai Framework creates alignment among state governments and the private sector, supporting their ability to work together to develop and implement a plan that reduces the loss of lives and livelihood when disaster strikes. Mexico, the location of this year’s Global Platform for Disaster Risk Reduction conference, has taken this idea to heart and has developed a system to warn both the government and civilians of any incoming earthquakes. Working together with investment groups and civilian contractors, the government has placed sensors around Mexico that give residents 30 to 60 seconds of warning, allowing them a head start as they rush to safety. How does the Sendai Framework in flight improve disaster risk reduction and increase resilience? What kinds of investment opportunities are available for companies that want to partner with countries and states seeking to develop disaster preparedness programs? 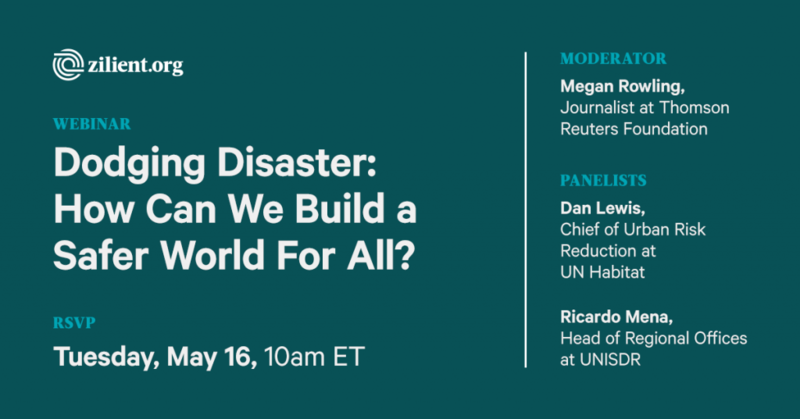 What trends and innovations are currently prevalent in disaster risk reduction? Why? Discover how the Sendai Framework helps global communities prepare for and recover from disasters and crises. Featured image was taken by UNISDR courtesy of Flickr.